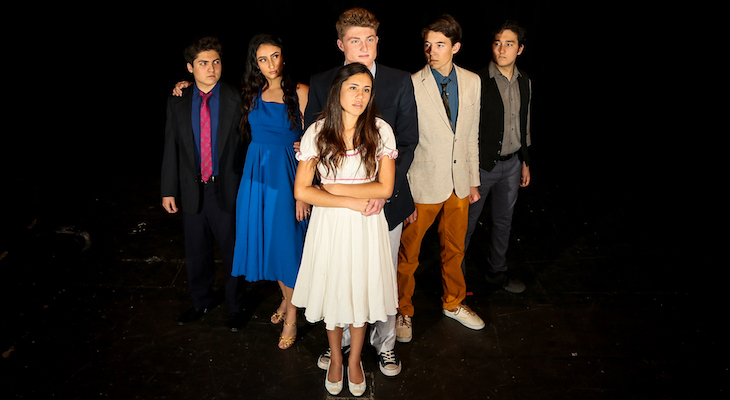 Dos Pueblos Charger Theatre will present the iconic musical WEST SIDE STORY April 5, 6, 12, 13 at 7pm and April 6 & 13 at 2pm in the Elings Performing Arts Center, 7266 Alameda Ave. Tickets are $10 for students/seniors and $15 for general admission. Due to its mature themes, it is not recommended for small children. WEST SIDE STORY is a timeless classic that seems to grow even more relevant each year since its September 26, 1957 Broadway opening. Its themes of racial reconciliation, immigration, treatment of women, and violence are mirrored in today’s immigration debate, as well as the “Me Too,” “Black Lives Matter,” and “March For Our Lives” grassroots movements. The cast and crew are thrilled to present a show that has the potential to instigate many important conversations. Although Dos Pueblos Theatre Company’s cast is one of the most diverse in its school’s history, they have teamed with Just Communities in order to dive deeper into some of these issues. Mitzi Perez taught a workshop on racial reconciliation where students examined their own biases., Andrea Medina initiated a Puerto Rican pen-pal project between cast members and Puerto Rican students to facilitate greater awareness of current Puerto Rican issues. Several cast members also participated in a day-long forum with Just Communities where they got to interact with local policy experts and decision makers. Nevaeh Harrington who plays Maria previously played a role in ALMOST MAINE at Dos Pueblos. Isaac Hernandez (Bernardo) played the lead (Juror 8) in DPTC’s Fall Production of TWELVE ANGRY JURORS, and a featured role in DPTC’s National Disney High School pilot of NEWSIES. Klarissa Neumann is playing her first role in a Dos Pueblos Theater Company production, although she has been a member of DP’s Award Winning Song Cheer squad. Having worked with WEST SIDE STORY’s lyricist Stephen Sondheim and producer Hal Prince, two of Broadway’s most influential figures, Sayre believes students need to know how West Side Story fits into the overall history of Broadway Musical Theater from CALL ME MADAME and WONDERFUL TOWN through to the famous Prince/Sondheim collaborations (COMPANY, FOLLIES, SWEENEY TODD) and right up to more current hits like INTO THE WOODS, EVITA and PHANTOM OF THE OPERA. Sayre also brought in WEST SIDE STORY original cast member and swing Julie McLeod (who covered every female ensemble member) to speak with the cast about her experiences sixty plus years ago and shed light upon Jerome Robbin’s original vision for the show. WEST SIDE STORY is that unique Broadway show with not only an important role in the overall development of the musical, but also a unique entry point for students and audiences of today. Tickets may be purchased at the door or by visiting dptheatrecompany.org. For more information, please email the show’s producer Taylor Vaughn at tvaughn195.00@gmail.com.